Hello hello!!! I apologize for my extended absence recently. Law school has been draining my time and energy away and good god can you believe I’ve only watched ONE movie this week?! Absolutely horrendous. The weekend is almost here so I need to set aside some much-needed movie viewing time. 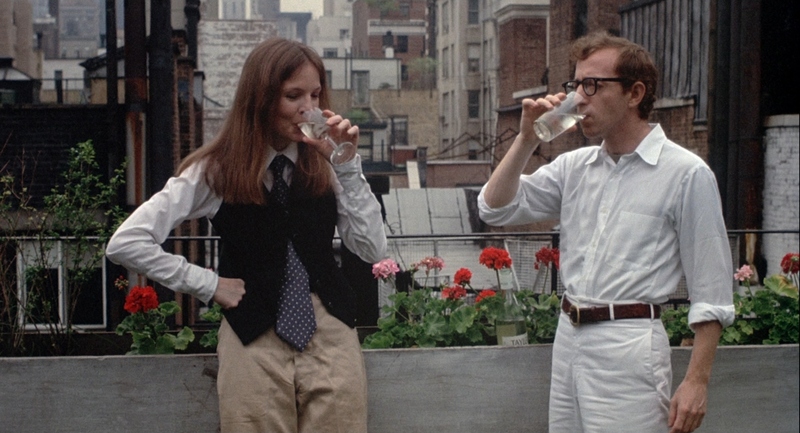 ANYWAY, I’m BACK for my review of Annie Hall (1977), directed by Woody Allen, and starring Woody Allen and Diane Keaton in the two main roles, along with others. Quick Liz summary: Comedian Alvy Singer (Allen) goes through the process of trying to figure out why his relationship with Annie Hall (Keaton) ultimately ended. He examines his prior relationships to Annie and then revisits the events, the ups and downs of their relationship. Annie Hall is one of those films that has consistently appeared on lists of classic movies, movies to watch before you die, etc etc. Not sure why it took so long for me to watch it, but about a year ago, Omar and I decided to start watching it while we were in Paris. We didn’t make it through; I guess Woody Allen’s annoyingly fast talking and a rather un-exciting start to the movie made us stop. Fast forward to a couple weeks ago, and we made it through finally and overall, enjoyed it! I’ll start with the stuff I didn’t like about the movie. I mentioned it already, but Woody Allen has this super fast way of talking. It’s not unique to this movie alone either and it annoys me every single time I hear it haha. He sounds like he’s always in a rush to get all the words out and I just want to tell him to slow down because he makes me anxious. Next, this isn’t really a DISLIKE, but I found this movie’s story and characters to be underwhelming. After hearing such rave reviews about this movie, I expected something more profound or impactful I guess? I found the characters to be uninteresting. I didn’t care for the relationship between Allen and Keaton’s characters at all; I didn’t care about what happened between them. I didn’t actually feel very much chemistry between them, which is interesting, because I know that Diane Keaton and Woody Allen were married for a hot second, and despite divorcing, remain great friends. The story didn’t make any impact on me at all and it wasn’t incredible to me like some of his other films (Midnight in Paris; Vicky Cristina Barcelona). It surprised me that this movie won so many awards including the Oscar for Best Actress (Diane Keaton), whose performance was fine but again, not THAT impressive to me) and the Oscar for Best Picture, amongst others. What I did like about this movie was the script/ dialogue. For this, I can understand why the movie won the Academy Award for Best Original Screenplay. The movie had some great jokes/ funny moments and perhaps at the time, it was pretty influential for the genre of comedy. I laughed many times throughout for some obvious moments but also for some pretty subtle, hidden jokes. Woody Allen manages to always come up with super witty dialogue that though exhausting sometimes, I generally enjoy. Also shout out to Diane Keaton’s wardrobe, which is kinda her own personal style in real life. Love it. 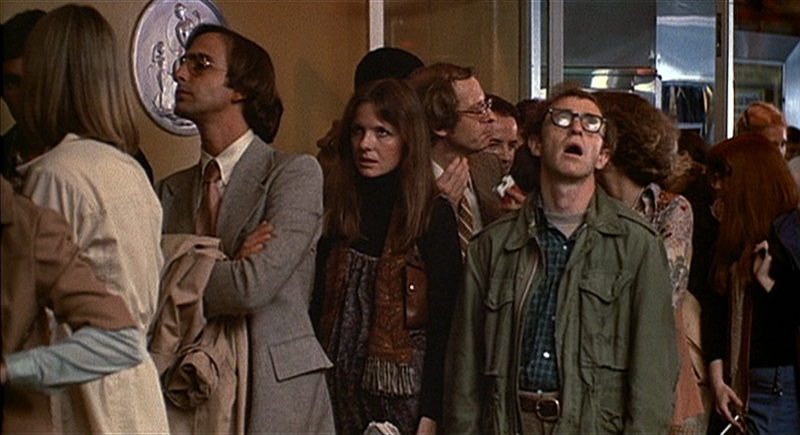 In the end, Annie Hall was not AMAZING to me, but a solid movie. I appreciated it but it’s definitely not a memorable or favorite film of mine. 5 out of 5 slaps to me though because again let me say that Woody Allen does not deserve to still be so influential in entertainment.